Ryan Reynolds has revealed that Blake Lively was not afraid of getting very sassy with her doctors when she was in labor, and to be fair, we can't really blame her. Speaking about the birth of their baby daughter James on Conan, Ryan joked: "Well, I was there for the conception of the child, so I thought the least I could do is be there in the delivery room. I'm not going to lie to you, I saw things!" 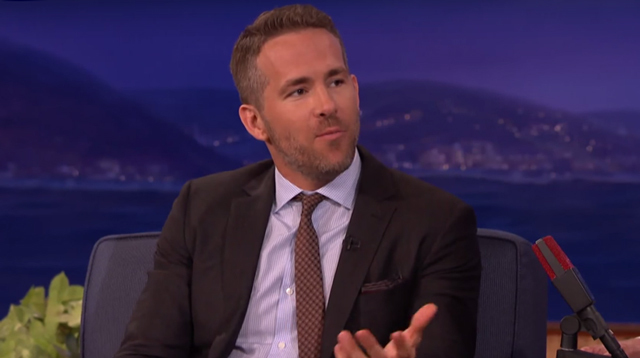 But while he said the experience was "amazing," Ryan seemed pretty impressed with Blake's no BS attitude with everyone in the delivery room, comparing her to comic book character Deadpool, who he's playing in an upcoming Marvel movie. "My wife is real, I mean she is a mercenary. At one point in the middle of the delivery, the doctor's cell phone went off and she said, 'Oh, no. Go ahead, take a personal call. Feel free.'" I mean…she has a point. He continued: "I was just a terrible coach. There was a lot of clapping. I went for a couple of high fives, but she did not." Bless Ryan, trying to high-five a woman in labor. It's about as good an idea as this kid cracking a bad joke while this woman bought sanitary towels. Just best avoided. Baby James is all about Blake at the moment, says Ryan, laughing that he doesn't stand much chance of affection when he isn't the one with the feeding machines strapped to his chest. "There's an unfair advantage there. It turns out that breasts are actually a life support system and the child seems to gravitate towards the breasts. I'm just the breastless a**hole wandering around the room and getting in her sightline every once in a while. All about mom. I am dead to her. That's her first words, ironically. 'You're dead to me.'"